Eleven years ago, I traveled to Florida to assist folks from the New York Turtle and Tortoise Society and other groups in rehabilitating thousands of turtles seized in southern China (please see this article for details). The event marked my introduction to what is now known as the “Asian Turtle Crisis”. Sadly, the situation remains dismal today. Recent studies show that turtles in the USA also face an extinction crisis. Yet the scale of the problem is largely unappreciated…for example, many conservation-minded people would be surprised to learn that over 12 million turtles were exported from the USA in the last 5 years (please see article below). 2011 was designated as “The Year of the Turtle” by the Partnership for Amphibian and Reptile Conservation (PARC) and affiliated groups. Happily, North American species seemed to get a bit more attention than usual. A recent article in Herpetological Review (2011: 42(2) 199-204) provided a comprehensive – if chilling – summary of the turtle-related concerns that PARC and others have been focusing on. The very informative article is not available online, so I’d like to highlight some key points here. Although tropical regions usually come to mind when reptile and amphibian diversity is mentioned, the USA is actually home to more species of turtles (and salamanders) than any other country. Of the world’s 320 species, 57 (and 24 subspecies) are native to the USA. 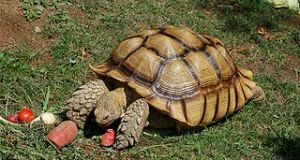 Mexico takes a close second with 40 chelonian species, and 12 manage to survive Canada’s somewhat “reptile-hostile” climate. Nine US turtles are included on the Federal Endangered Species List, but others undoubtedly deserve stricter protection. Low reproductive rates and long generation times pre-dispose turtles to survival problems. As is true elsewhere, habitat loss and over-collection (food, pet and medicinal trades) seem to be the main reasons behind turtle declines in the USA. Burgeoning raccoon populations add to the woes of several at-risk species. Red-Eared Sliders, widely introduced, often out-compete native turtles, and potentially threaten Big Bend Sliders and other rare relatives via hybridization. All of Canada’s turtles are at the northern limits of their ranges, and so are especially susceptible to local extinctions. The USA also hosts a number of endemic turtles, several of which are put at risk by their tiny natural ranges. The entire US Sonoyta Mud Turtle population, for example, is limited to a single reservoir; its range in Mexico is not much greater. The Alabama Red-Bellied Turtle occurs in but 4 counties, while the Flattened Musk Turtle inhabits a single river system in Alabama. Eight of our Map Turtles may be found in only one, or a very few, river systems. Pollution and human use reduce the effective ranges of these species to an even greater degree. Wider-ranging turtles with very specific habitat requirements, such as Bog Turtles and Desert Tortoises, fare no better than those with small ranges. Depending upon the criteria utilized, 47-57% of the world’s turtle species are threatened with extinction. The IUCN has reviewed and listed 207 of the 320 described species. Of these, 152 have been placed in “Rare” or “Threatened” categories. Twenty-one species, and all marine turtles, are included on CITES Appendix I, which prohibits trade except under exceptional circumstances. Twenty-three species, 7 Genera and 1 Family, also threatened, are listed on CITES Appendix II. 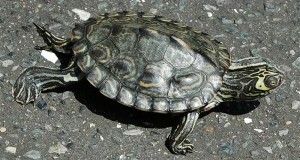 A CITES III designation, requiring trade monitoring, is applied to 18 turtle species and 1 Genus. Harvest regulation, captive breeding, crisis intervention (seizures, oil spills), “keeping common species common” and other well-known strategies have all been proposed and used for various turtles. Many years of work in both zoos and the private sector have convinced me that increased cooperation between the two is also essential. The Turtle Survival Alliance initially started down this path, and made some great progress. I hope the organization continues in that direction. In addition to intense dedication and husbandry skills, private turtle keepers sometimes offer financial resources and physical space that zoos find hard to match (turtles rarely compete well with gorillas, tigers and other popular mammals for zoo resources). Please take a look at this up-coming day-long seminar (which I’ll attend) given by the New York Turtle and Tortoise Society for an example of the fine work being done by the private sector, and please consider becoming involved on some level…don’t hesitate to write in if you need ideas. I’ve been a student of and advocate for turtles since 1944. I found your comment above, suggesting the possible benefit to threatened turtles, of cooperation between zoos and private parties, to be most interesting and one with which I’d enthusiastically concur. 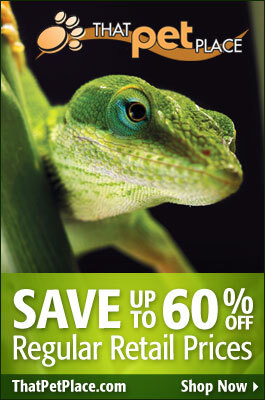 I also noted your statement, that populations of 90% of particularly endangered species seem to be improving. I would ask if that figure includes the US Bog Turtle? Thanks for the kind words and interest. I’m a bit behind in some work right now, but have made a note to check the Turtle Forum thread…have been good conversations there in the past. Monitoring bog turtles is tricky, due to their secretive ways, nature of the habitats, etc. John Behler, with whom I worked for many years at the Bx Zoo, monitored 1 small population for over 30 years; I helped out on occasion,; we were constantly surprised by at the difficulties involved in tracking even an isolated group. This site has info on the US F&W position, outlook, etc. As you can see, it’s worded in general term, hard to draw any conclusions. State assessments are often more specific.